Composed of Phalanx techno-organics, Click possesses most of the abilities inherit to them such as a malleable and regenerative form. 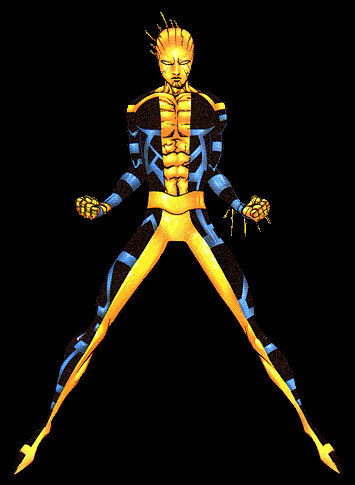 He also has the mutant ability of telepathy, though lacks the ability to control it and often broadcasts his thoughts. It is unknown whether the Phalanx assimilated Click during their first attempt at invasion or the smaller release of them by the Hellfire Club. Presumably, he was assimilated before the manifestation of his mutant telepathy, which resulted in his inability to control it. Click was discovered by X-Factor staying in an old secret base in an Oregon farm, which was formerly used by X-Force. X-Factor took him with them when they were reinstated by the government, and now he serves as a member of the team. During X-Factor's brief stay on Muir Island, Click encountered a fellow Phalanx, Douglock. In their meeting, Douglock was able to establish a link with Click that has begun to unlock dormant memories in his mind.